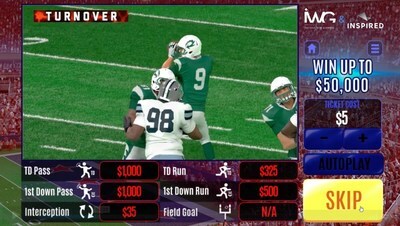 Michigan Lottery Launches Endzone Payout | Inspired Entertainment, Inc.
LONDON and NEW YORK, Jan.30, 2019 /PRNewswire/ -- IWG, the award-winning supplier of online, instant-win games, and Inspired Entertainment (Nasdaq: INSE), a world leader in virtual sports, have delivered a new Instant-Virtual Football game, Endzone Payout, to the Michigan Lottery. This news release contains "forward-looking statements" within the meaning of the "safe harbor" provisions of the U.S. Private Securities Litigation Reform Act of 1995. Forward-looking statements may be identified by the use of words such as "anticipate", "believe", "expect", "estimate", "plan", "outlook", and "project" and other similar expressions that indicate future events or trends or are not statements of historical matters. These statements are based on our management's current expectations and beliefs, as well as a number of assumptions concerning future events. Such forward-looking statements are subject to known and unknown risks, uncertainties, assumptions and other important factors, many of which are outside of our control and all of which could cause actual results to differ materially from the results discussed in the forward-looking statements. Accordingly, forward-looking statements should not be relied upon as representing our views as of any subsequent date, and we do not undertake any obligation to update forward-looking statements to reflect events or circumstances after the date they were made, whether as a result of new information, future events or otherwise, except as may be required under applicable securities laws. Factors that could cause actual results to differ materially from those expressed or implied in forward-looking statements can be found in our reports filed with the Securities and Exchange Commission, including our annual report on Form 10-K, our quarterly reports on Form 10-Q and our current reports on Form 8-K, which are available, free of charge, on the SEC's website at www.sec.gov and on our site at www.inseinc.com.